The neurenteric cyst is a rare lesion of the spinal axis. It is composed of heterotopic endodermal tissue. During the 3rd week of human embryogenesis, the neurenteric canal unites the yolk sac and the amniotic cavity as it traverses the primitive notochordal plate. Persistence of the normally transient neurenteric canal prevents the appropriate separation of endoderm and notochord. This anomalous union manifested as congenital abnormalities of the spine. It is defined by the presence of mucus-secreting epithelium reminiscent of the gastrointestinal tract. It is presented with pain and myelopathic symptoms. Septic or chemical meningitis can also occur. A variety of approaches are described in the treatment of neuroenteric cysts each with a goal of total surgical resection. Enterogenous cyst is otherwise known as Neuroenteric cysts. 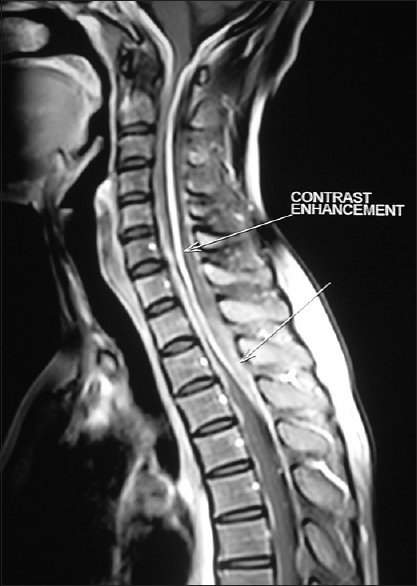 It is presented as rare intra-spinal masses and less frequently intra-cranial lesions. It probably arise during notochordal development and transitory existence of the neuroenteric canal, where it persists to exist. Neurenteric cystic lesions were first described by Kubie and Fulton in 1928 as teratomatous cysts and later by Puusepp in 1934 as intestinomas. Holcomb and Matson coined the term neurenteric cyst in 1954.,, Neurenteric cysts account for 0.7-1.3% of all spinal cord tumors. Approximately 90% of neuroenteric cysts are located in the intradural or extramedullary compartment and 10% are divided between an intradural and intramedullary or extradural location. Incidence is more than 80% intra spinal and 10-15% intra cranial.,,,,,,,, It can present any age- mostly under 40 yrs of age. Peak incidence is in first decade and slight male preponderance. Common sites are thoracic spine. Most common site is anterior to spinal cord.,, It is situated Intra dural and extramedullary. Intramedullary type is very rare. A 39-year-old female presented with weakness and numbness in all the four limbs of 1-month duration. There is no history of trauma. She is not a known case of diabetic, hypertension, or pulmonary tuberculosis. General examination was normal. On neurological examination, head, face, and cranial nerves are normal. There are no cerebellar signs. On spine and motor system examination, normal tone in both upper limbs and hypertonia in lower limbs. Upper limb power is 4/5 and lower limb power is 3/5. Deep tendon reflex (DTR) in the upper limb-left biceps jerk depressed, and all other DTRs are exaggerated. Bilateral plantar is extensor. Romberg's test is positive. Sensation is reduced below D4. All basic investigations are normal including serum electrolytes. 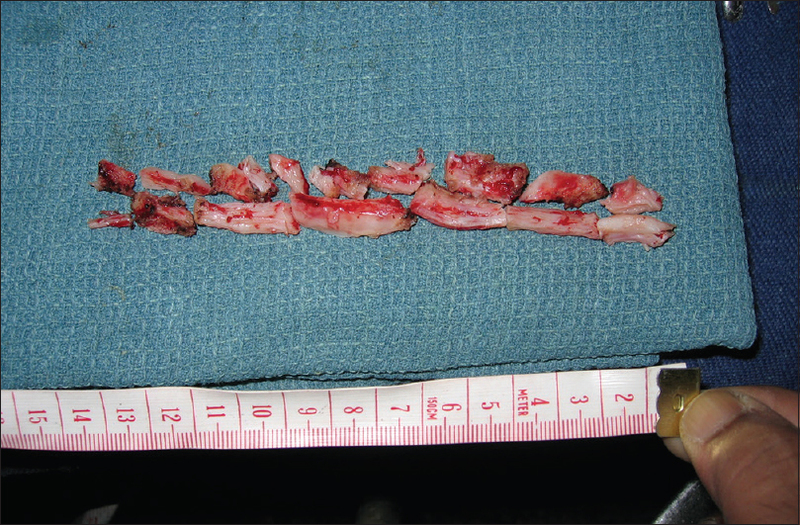 Magnetic resonance imaging showed severe cord compression both anteriorly and posteriorly with thinned out cord. Lesion is hypointense in both T1 weighted and T2 weighted [Figure 1], [Figure 2], [Figure 3], [Figure 4]. 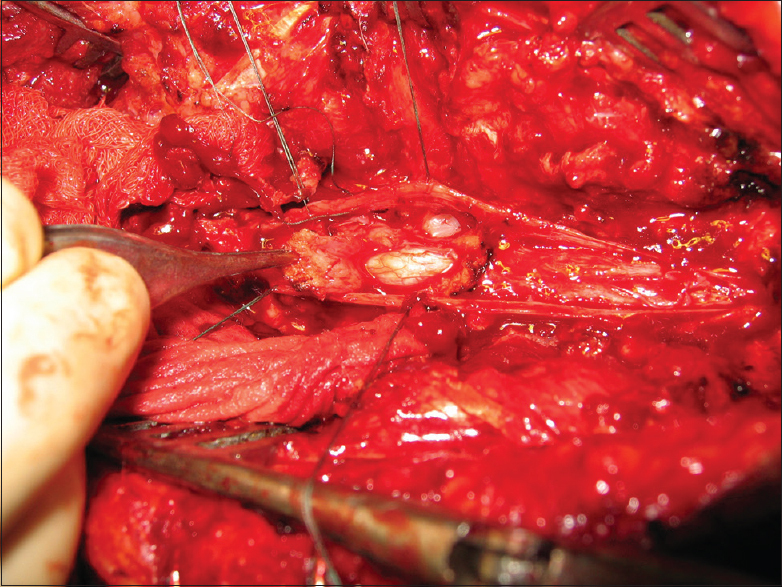 Preoperative differential diagnoses are en plaque meningioma, en plaque tuberculoma, and ossified posterior longitudinal ligament with thickened ligamentum flavum. Procedure done was posterior cervical decompression from craniovertebral (CV) junction to D3 and subtotal excision of space occupying lesion. Intraoperatively, the lesion was thick, firm, and avascular and was situated intradurally about 14 cm in length. It was encircling the cord [Figure 5], [Figure 6], [Figure 7], [Figure 8]. The dura was firmly adherent to the lesion and was difficult to separate. Immediate postoperative period patient showed improvement of power to 4/5. She became drowsy on the 5th postoperative day (POD). Her potassium level was 2.7 mg/dl. She showed improvement after potassium deficiency was corrected. She became quadriplegic on the 10th POD. Her serum electrolytes showed normal values. Investigations are done for the postoperative deterioration. Serum electrolytes are normal. Computed tomography (CT) brain showed posterior interhemispheric bleed and thin bifrontal subdural hygroma. CT cervical spine showed postoperative changes. We lost the patient on the 13th POD. The exact cause of death is not known as routine autopsy is not done at our institute. 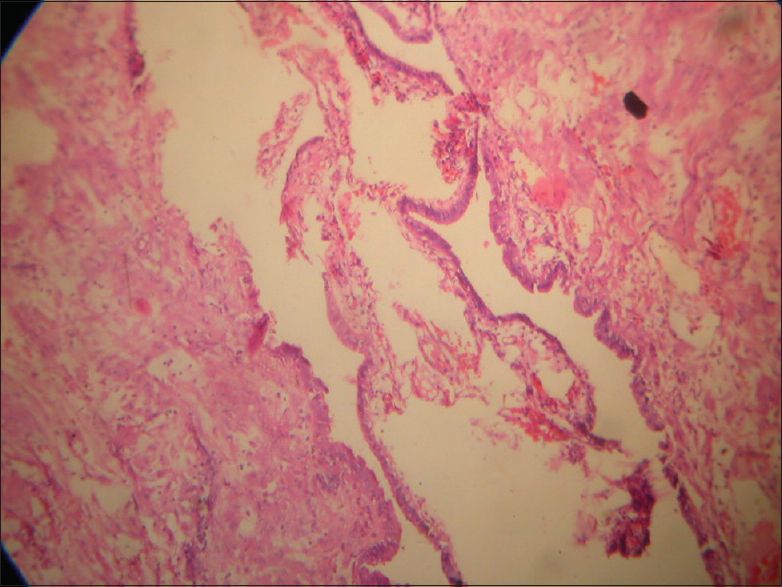 Histopathological findings showed ciliated columnar lined cystic spaces with few papillae, containing goblet cells, and subepithelial clusters of lymphoid follicles – typical picture of enterogenous cyst [Figure 9], [Figure 10], [Figure 11], [Figure 12]. Surprisingly, we were not able to visualize any cystic space intraoperatively and macroscopically. Enterogenous cyst is common in the lower cervical and the upper dorsal region. It is usually situated in anterior to the cord and mostly cystic. 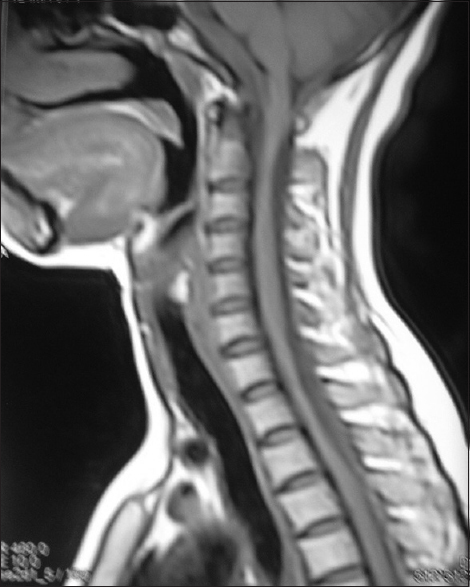 Compression at high cervical region producing quadriparesis is rare. 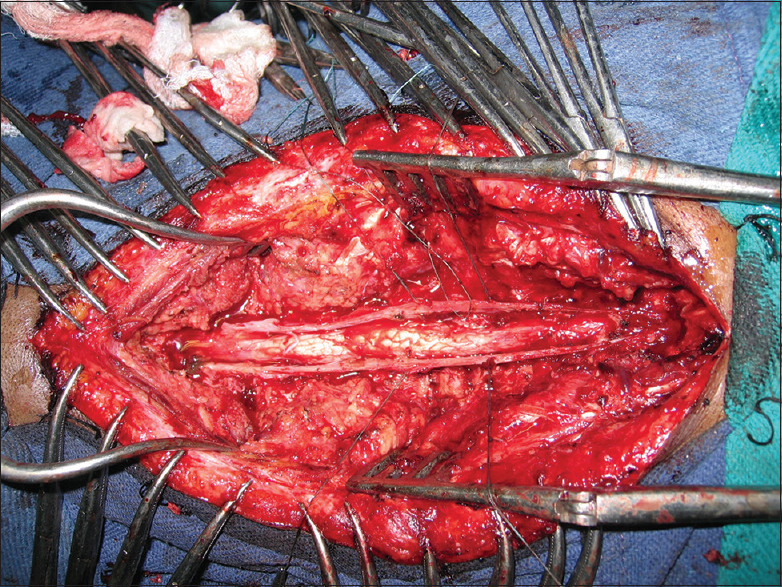 Our patient had an extensive lesion from CV junction to D2 encircling the cord and fibrous in nature. Cyst was noticed only microscopically. MRI and CT scan are essential diagnostic tools for the delineation of cyst form and overlying osseous architecture., MRI shows lobulated intra dural extramedullary mass, usually slightly hyper intense to CSF. Associated vertebral anomalies are seen in 43%. Gross appearance is well delineated, thin-walled fluid –containing masses. Differential diagnosis are Arachnoid cyst, Epidermoid cyst, Inflammatory cyst. Holcomb GW Jr., Matson DD. Thoracic neurenteric cyst. Surgery 1954;35:115-21. Kubie LS FJF. 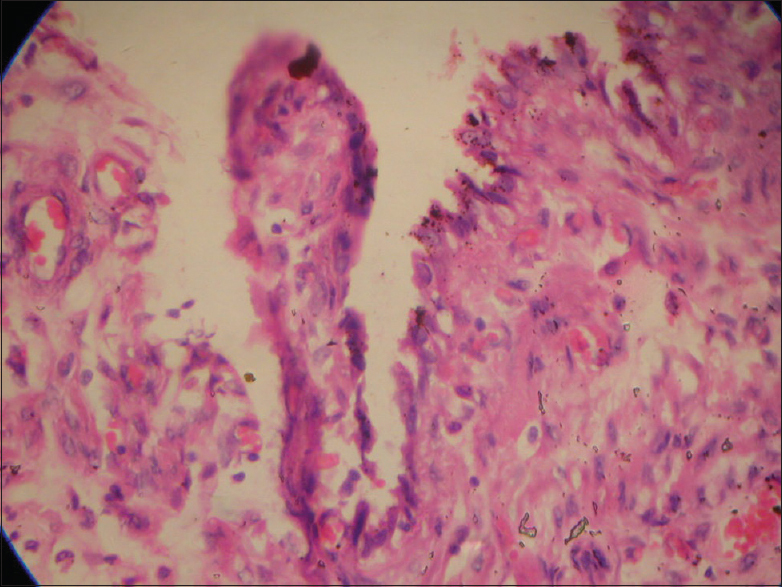 A clinical and pathological study of two teratomatous cysts of the spinal cord, containing muscus and ciliated cells. Surg Gynecol Obstet 1928;47:297-311. 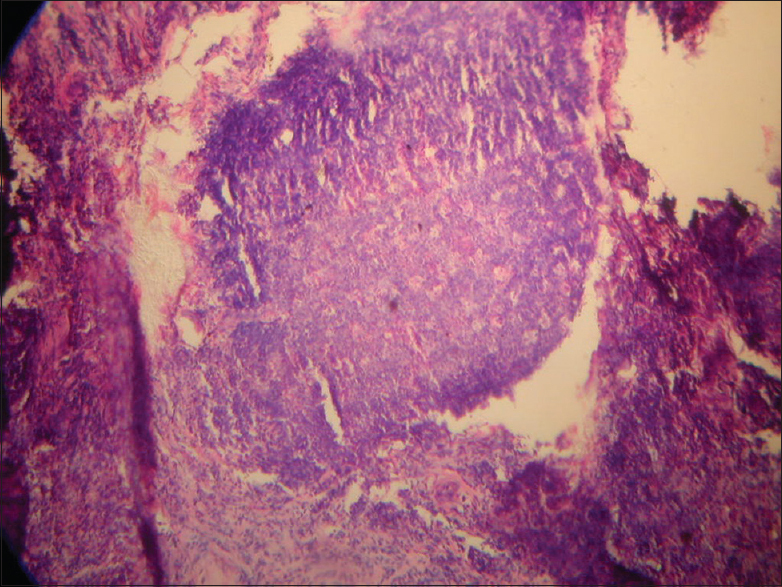 Puusepp M. The spine defined by the presence of mucus-secreting epithelium reminiscent Rev Neurol Pari 1934;2:879-86. Lippman CR, Arginteanu M, Purohit D, Naidich TP, Camins MB. Intramedullary neurenteric cysts of the spine. Case report and review of the literature. J Neurosurg 2001;94:305-9. Wilkens RH, Odom GL. Spinal intradural cysts. In: Vinkin PJ, Bruyn GW, editors. Tumors of the Spine and Spinal Cord, Part II. Handbook of Clinical Neurology. Vol. 20. North Holland: Amsterdam; 1976. p. 55-102. 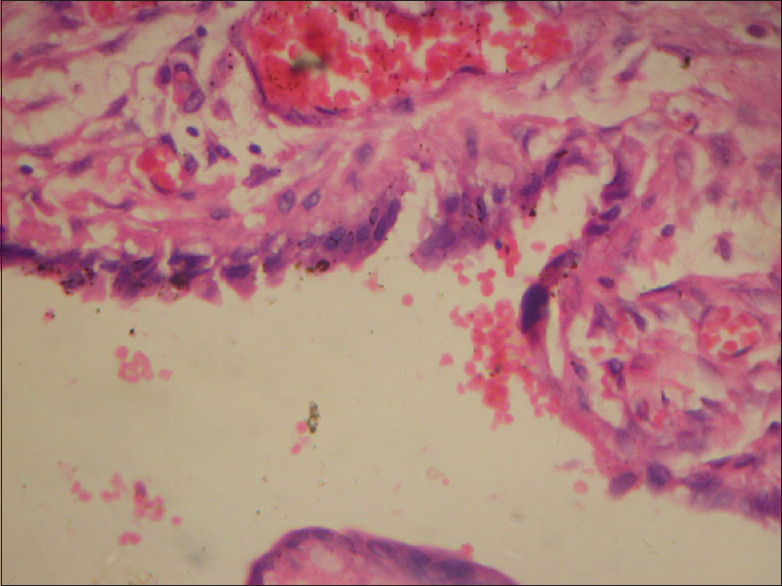 Knight G, Griffiths T, Williams I. Gastrocystoma of the spinal cord. Br J Surg 1955;42:635-8. Mizuno J, Fiandaca MS, Nishio S, O'Brien MS. Recurrent intramedullary enterogenous cyst of the cervical spinal cord. Childs Nerv Syst 1988;4:47-9. Arai Y, Yamauchi Y, Tsuji T, Fukasaku S, Yokota R, Kudo T, et al. Spinal neurenteric cyst. Report of two cases and review of forty-one cases reported in japan. Spine (Phila Pa 1976) 1992;17:1421-4. Rao MB, Rout D, Misra BK, Radhakrishnan VV. Craniospinal and spinal enterogenous cysts – Report of three cases. Clin Neurol Neurosurg 1996;98:32-6. 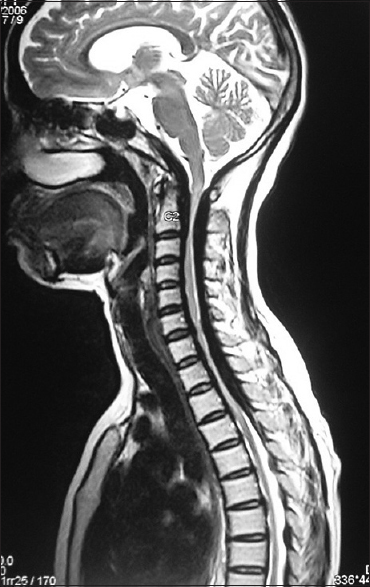 Cai C, Shen C, Yang W, Zhang Q, Hu X. Intraspinal neurenteric cysts in children. Can J Neurol Sci 2008;35:609-15. Kwok DM, Jeffreys RV. Intramedullary enterogenous cyst of the spinal cord. Case report. J Neurosurg 1982;56:270-4. Sasani M, Ozer AF, Oktenoglu BT, Peker K, Bozkus MH, Sarioglu AC, et al. 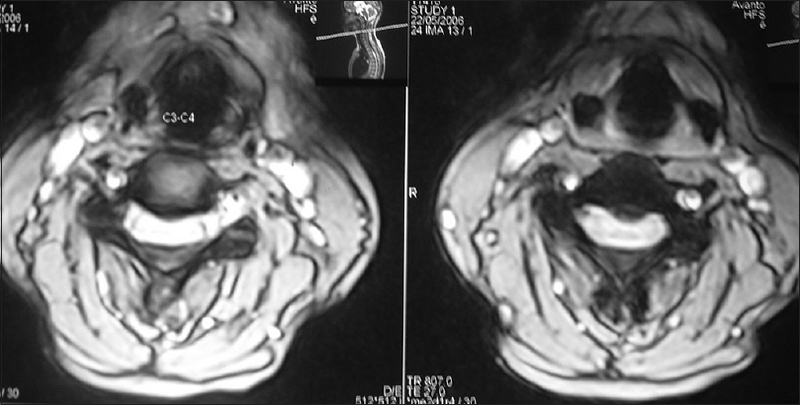 Excision of an asymptomatic cervical intradural neurenteric cyst through the anterior approach: A study of two cases and a review of the literature. Spine J 2007;7:720-7. Kimura H, Nagatomi A, Ochi M, Kurisu K. Intracranial neurenteric cyst with recurrence and extensive craniospinal dissemination. Acta Neurochir (Wien) 2006;148:347-52. Yasuda M, Nakagawa H, Ozawa H, Inukai C, Watabe T, Mizuno J, et al. Disseminated neurenteric cyst. 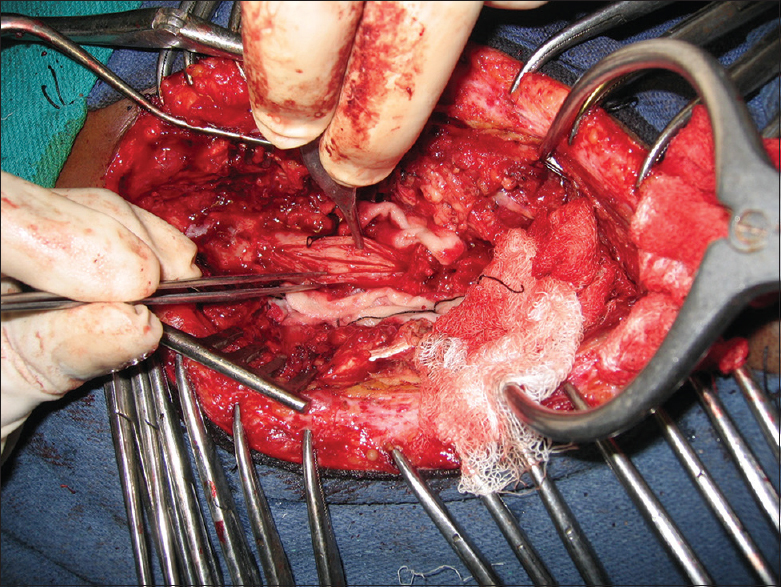 J Neurosurg Spine 2008;9:382-6. Miyagi K, Mukawa J, Mekaru S, Ishikawa Y, Kinjo T, Nakasone S, et al. Enterogenous cyst in the cervical spinal canal. Case report. J Neurosurg 1988;68:292-6.